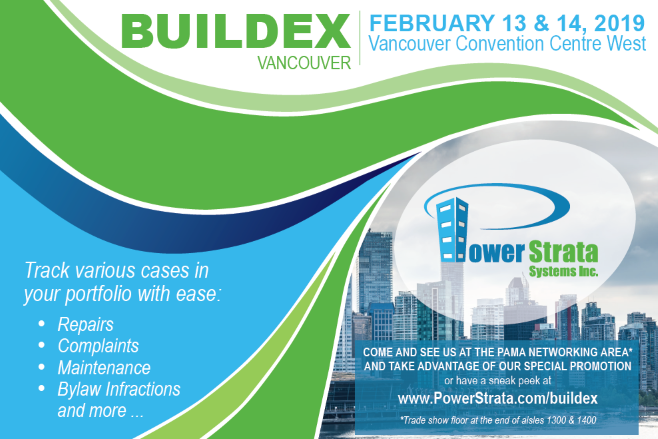 Along with moving to a new office space as of February 1st, we are excited and busy getting prepared for exhibiting at BUILDEX VANCOUVER on February 13 and 14, 2019 at Vancouver Convention Centre West. It has been a very busy and exciting year for us for sure! You can find us at PAMA Networking Area on the tradeshow floor at the end of aisles 1300 & 1400. Come and see us and take advantage of our special promotion or if you don't get a chance, click here to get information on our limited time special promotion for the tradeshow this year. Use complimentary code BXV19 to register for free for your tradeshow pass to access the exhibition floor ($25 value). Looking forward to seeing you at PAMA Networking Area on February 13th and 14th!